Knitted hats come in different ears, with brushes, sports helmets and more. 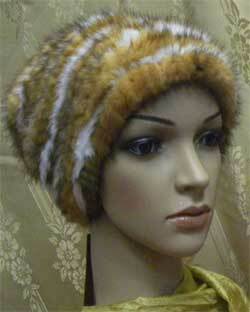 But special popularity today acquire knitted fur hats mink. Lightweight and original, it became a winter hit. And such an unusual thing, you can link the normal way. Knitted hat made of mink on the actions performed are fairly easy. But by the time this work is very laborious. To knit a hat made of mink fur, you need to pick up all the materials - thread, needles, hook. Next you need to prepare the skin of a mink for knitting. To do this, take a piece of fur and cut it with a razor in a spiral so that it was not a cliff. Then you sew the pieces together. Some sources suggest they stick to each other, but it can ruin the appearance of fur. The width of the strips need to be adjusted by how thick or thin you want the hat to get in the end. The average strip width of about 5 millimeters is obtained. After mink threads are prepared, take the needles and dial them to the desired number of loops. Start to knit a traditional hat from yarn. Knit, adding and subtracting loops after periodic fittings. Hat fit regular front surface. Then you need to handle the end. Very beautiful, you need to wrap the tail of the mink. For this purpose it should be cut into strips. Then they have to sew on the growth of hair and wrap the end of the piece, with such frequency that you like. To tie the cap of mink crochet, you need a fur cut into thin strips. Then twist so that the hair was inside and out. And then you can start knitting. This procedure is the same as the spokes. Plus, these hats is that they come out very thin, almost weightless, but very very warm. And besides, these hats unusual and very original. The warmth and softness of it are due to the fact that fit this hat is double thread. That is, in lining it is also not needed, because the fur is on the inside and outside. The only drawback is the fur on this hat, it goes quite a lot. If we translate it into a finished sewn product, it is necessary for the production of a knitted mink hats, two stitched from solid pieces of fur.